WOW! We are blown away by the support from our community! ​We are honoured to announce that Aaron's Butterfly Run Ottawa/Gatineau on Saturday October 14th 2017 at Brewer Park was a huge success! With almost 500 participants, and with the help from our incredible partners, sponsors, and amazing volunteers, we were able to raise an incredible total of $30,671.35 for Roger Neilson House, a program of the Children's Hospital of Eastern Ontario (CHEO). The money raised came directly from 100% of participant registrations, generous donations, and the sale of butterfly wings at our event. Thank you again to everyone who supported Aaron's Butterfly Run Ottawa/Gatineau. Not only we were successful in raising funds for Roger Neilson House, we hope that we also increased the level of awareness and support in our community for those who experience pregnancy loss, infant loss, and infertility. Please keep sharing the resources in our community that exist for those who go through those losses. You are not alone in this journey. Again, thank you everyone! Today and everyday, lets remember our Butterfly babies! Below you will find photos from the event. We hope you enjoy reminiscing. Thank you so much to our amazing photographers who volunteered their time to photograph Aaron's Butterfly Run Ottawa/Gatineau! We know your time and effort goes beyond taking photos on the day of - thank you for making yourselves available, donating your time to prep before the event and to edit the photos afterwards. We appreciate you helping us capturing memories from this event! If you'd like print-quality copies of these images, please connect with us and we can send you the high resolution image without a watermark so you can print a copy for yourself. Based on amazing fundraising efforts to support the overhead costs of Aaron's Butterfly Run Ottawa/Gatineau, there were additional funds remaining. 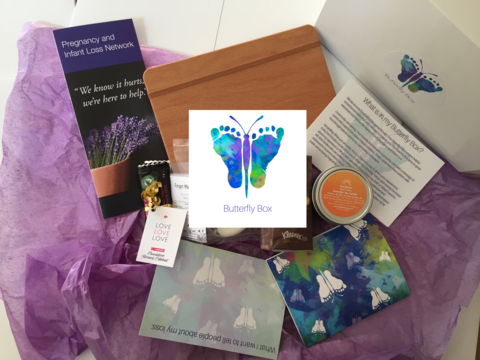 The run's coordination committee decided to donate $1,000 to support the Butterfly Box for individuals and families in Ottawa and Gatineau experiencing pregnancy and infant loss. This project is a partnership between the Butterfly Run Ottawa/Gatineau and Mom Friends, also with thanks to Just Change Ottawa who provided an initial kick-starter grant of $1,000. We also had $2,000 remaining from our fundraising efforts. We've chosen to use this to help fund a Butterfly Run in Ottawa/Gatineau in 2018. If these funds are not required to support a 2018 Run, they will be directly donated to Roger Neilson House. Thank you again to everyone who made Aaron's Butterfly Run Ottawa/Gatineau such a success!